Are you tired of constant changes in search engine algorithms that affect your site's rankings? Do you wish to have your hands on an automated tool that will ease your marketing campaigns? If yes, you're not alone; many marketers as well as business owners are looking for a sure-fire way to get better marketing and sales results. The good news is there are tools such as clickfunnels and leadpages that yield proven results. However, you should make the right choice between these two tools for your marketing tenure. 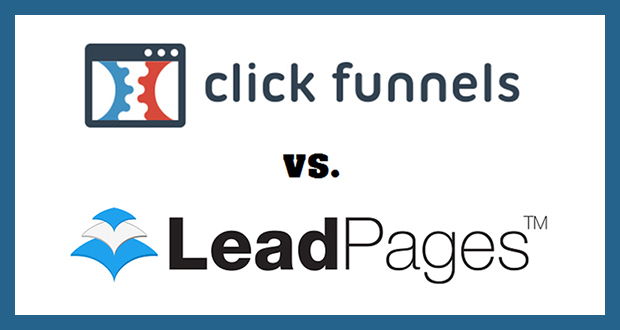 If you need help and information in this respect, take a look at the below clickfunnels vs leadpages comparison. It's a tool for creating killer landing pages, sales funnels and making membership website. The tool also integrates with PayPal, Stripe and other major payment processors. Clickfunnels has its own analytics software for tracking the success of your sales and landing pages. Additionally, it allows you to conduct A/B testing of web pages, which in turn lets you optimize your pages for most leads as well as sales. Using clickfunnels is fairly simple. This innovative program features an easy to use drag and drop option that can be used by any person. Clickfunnels moves you ahead of others on account of its multi-functional features. You may also set up an auto-responder and/or manage affiliates with this handy tool. As the software includes a built-in email marketing option, it's easy to synchronize sales pages with email follow up for better results. When you choose clickfunnels, you don't need to worry about hosting. The program comes with free hosting. All you have to do is choose a custom domain to get going with your marketing campaigns. However, this highly useful tool is high-priced. Consequently, it may not be ideal for novice marketers or small businesses that have limited funds for marketing. It's a simple tool that helps to build landing pages. Leadpages integrates with leading email providers to capture leads in order to nurture those leads. It's simple, takes less time to load and lets you craft highly optimized landing pages that convert into sales. The best thing is you don't have to be a coding expert to use the software. Leadpages is a cutting-edge solution for generating leads online, via social media platforms, text messages, and emails. Using the drag and drop feature, you can make killer landing pages by dropping elements such as texts, buttons, widgets, and images. Even an average person can easily get started with this amazing software. This handy marketing tool includes a series of mobile-friendly templates to select from. Leadpages lets you do A/B testing of pages before choosing them. Consequently, the performances of your landing pages improve to a substantial level. The tool can be integrated with many applications, allowing you to do a lot more than just building landing pages. With leadpages, it's easy to capture leads and send those leads to CRM, email list, webinar platforms or all of the three. Additionally, you can monitor the performance of your pages with the built-in analytics. Leadpages sends you lead notifications in case you haven't set up an email service. You may also convert your landing pages into multimedia by embedding videos into leadpages. Most importantly, the tool is modestly priced to suit the budget of all. However, it lacks advanced features required at an advanced stage of marketing. Thriving in this highly competitive online world can be a herculean chore. However, you can ease this chore by choosing top marketing applications such as clickfunnels or leadpages. Check out this clickfunnels vs leadpages comparison in view of your particular marketing needs and choose the right tool to take your venture to new heights.